Phuket has a wide diversity of hostels, guesthouses, and resorts. Like elsewhere in Southern Thailand, the prices can be higher than other parts of the country and the quality can vary. It's usually more affordable to stay in Phuket Town than it is on the beach. Local buses travel between the town and the beaches frequently and it's also possible to hire a motorbike. If you're traveling during the peak season, reservations are typically recommended. If you're more flexible about where you stay, it's usually possible to find hostels once you arrive in town and there are a variety of places that aren't listed on the typical booking websites. The predictability of the accommodation quality varies because many hostels and guesthouses frequently change management. There is also a steady turnover of new places opening and older places closing. Hostels that are recommended in the popular guidebooks often raise their rates and let their quality drop so these options are also hit or miss. It's recommended that you read the most up-to-date reviews by recent travelers before you make your reservations or talk to travelers while you're on the road. 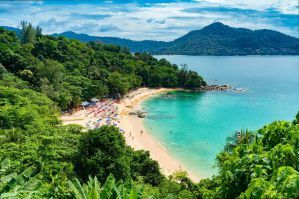 How much do hostels in Phuket cost? 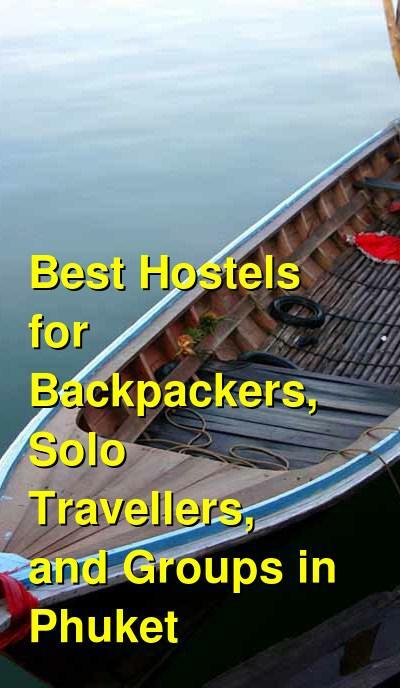 A popular hostel for backpackers, solo travellers, and small groups of friends. Bodega Phuket is one of the more popular backpacker hostels in Thailand. It has a relatively relaxed atmosphere and there are usually people hanging around that you can chat with. There's also an attached music cafe and gallery. It's about a five or ten minute walk from the beach and is not far from the major nightlife scene along Bangla Road. Despite it's convenient proximity to everything, this hostel is still set back on a quiet street where you can get a decent night's sleep. The hostel has a variety of amenities available for guests including a computer station, game rooms, and a lounge area. The cafe offers coffee, smoothies, and both Thai and international food, and it's the perfect place to relax and hang out with other guests. The staff are helpful and they can help you arrange any number of day trips. Options include dive trips, island excursions, sea canoeing, ziplining, and more. Prices are reasonable, but make sure you understand all of the details before you book any trips. The hostel has double private rooms and dorms available. The private rooms have king sized beds, air conditioning, and attached bathrooms. There is an eight bed dorm and four bed dorms that you can choose from as well. This is relatively new at the time of writing (2016). The facilities are new and modern and the location is good. It's a large hostel but it can be a bit difficult to meet other travelers. It's a relatively quiet place to stay and it appeals to a wide range of travelers. The hostel has both dorms and private rooms available. There are double and twin private rooms as well as four bed dorms (including both female only and co-ed options). The hostel also has several communal areas, business facilities, and on-site poole, patio, and a cafe and bar. The hostel is well located about a five minute walk from many great shops, bars, and restaurants. It's close to the beach and is a nice place to unwind after a busy day exploring the area or a late night out on the town. A quiet and safe hostel that is a good option for backpackers, budget travellers, and female travellers. Southern Fried Rice is another popular place to stay in Phuket. It feels more like a guesthouse than a hostel but it is a comfortable option at a very good price. It's located in Kata near one of the area's best beaches. Some of the area's best nightlife is also within walking distance. The hostel has all kinds of amenities for guests. There is a restaurant that serves both Thai and restaurant food. There's also free wi-fi, public computers, a pool table, and a large television. There are a variety of activities available to guests including Thai language lessons and various tours. There are no dorms available, just private rooms. Rooms range in size and include doubles, triples, and quads. Double rooms have a choice of shared or private bathrooms and all other rooms have private attached bathrooms. A good hostel for surfers and backpackers. Fin Hostel is another good option in the Kata Beach area. It's located in Kata Night Plaza and is about five minutes from the beach and twenty minutes from downtown Phuket. The hostel has a variety of facilities available for guests including a rooftop pool, two common rooms, a large television, a full shared kitchen, and free wi-fi. This is a friendly and comfortable place to stay. They keep it clean and it has a social but relaxed atmosphere. It's not hard to meet other guests, but you can also find a quiet space if you want to relax by yourself for a little while. The staff are also friendly and can help with any tours or activities that you might want to arrange. The hostel has private rooms and dorms available. Private rooms are twins with attached bathrooms and dorms sleep either six or ten people and both female only and co-ed rooms are available.